Your seeds should be planted when received for best results. Getting started -- Soak your seeds in a cup of water for 12-18 hours (not more than 36 hours). Use containers at least 2 inches (5 cm) tall with drainage holes. For soil, use a well draining mix. I use a mix of 1 part coir fiber to 1 part perlite (use small- or medium-grade perlite, not coarse-grade). An alternate mix is 2 parts quality potting soil to 1 part perlite. Place a seed in each pot and cover with 1/2 inch (13 mm) of soil. Water the soil until it is evenly moist (but not saturated). The best temperature for germination is between 66 to 77° F (19-25). Nights cooler than this are ok. Avoid temperatures above 80° F (27°C). I recommend placing a minimum/maximum thermometer near the pots. Until they sprout, keep the soil surface moist. Keep the pots in an area with some air circulation, to prevent stem rot later on. The seeds can sprout at different times, usually between 3 weeks and 2 months, but occasionally longer. Once they sprout, give them bright light, but shade them from strong afternoon sun (See: "Growing indoors with LED lights"). Occasionally a seedling may not shed its seed coat after it emerges from the soil. If the seed coat doesn't fall off by itself by the 4th day, try to gently pry it apart with your fingernails, tweezers, etc. You don't need to remove it, just spread it open and the leaves should push it off. Watering -- Aim to keep the soil evenly moist most of the time. Don't let the soil dry out completely, but also avoid keeping it soggy. If you're unsure if the soil down in the root zone has the right moisture, consider using a moisture meter . Fertilizing -- The first 2 months, feed weekly with a small amount of dilute (1/8 strength) liquid fertilizer. Hydroponic fertilizer is ideal for small seedlings, because it is easily absorbed and contains all essential nutrients. After 2 months, you may switch to a granular fertilizer that contains micronutrients, following the dosage on the package. Or continue feeding weekly with liquid fertilizer at 1/8 strength. Transplanting - When your seedlings are about 4-6 weeks old, repot to containers about 1 quart (1 liter) in size, and then on to 1-2 gallons (4-8 liters) a few months later. It's a good idea to water the soil before repotting, to keep the soil ball from breaking apart, which can damage the roots. Wait until your plants are 15 inches (35 cm) tall before planting them in the ground (in suitable climates). If you plan to keep them in containers indefinitely, the final size of the pot will depend on how large you let your plant grow. A full-size tree may need a very large pot! You may prune your plants to any size that is convenient. Lighting -- It likes bright light with some sun, but protect the plants from strong afternoon sun, especially in warmer climates. They can take full sun in cool conditions like coastal California, but they will need more fertilizer and water. 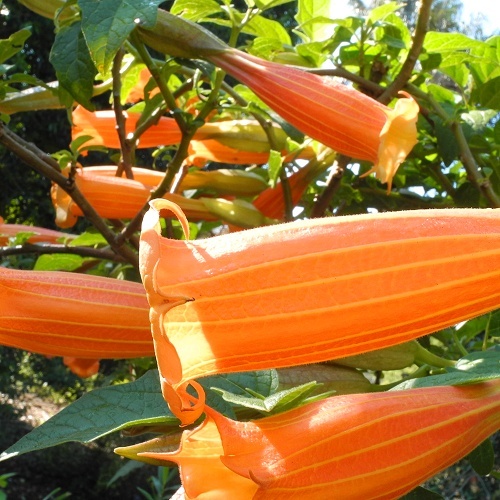 Climate -- This Brugmansia is happiest with temperatures below the low 80s (28°C), and nights that are cool (below 65°F / 18°C). It might not thrive in consistently hot conditions, particularly if nights are warm. Older plants can probably survive a few degrees of frost, but i recommend protecting it from freezing temperatures, especially the first 18 months. Pests -- Watch for any pests that can affect your other plants. Try using insecticidal soap spray before using stronger remedies, since some may harm the plant. If you have any questions or problems, feel free to contact me.